What a sail! After a very slow start with VERY light winds necessitating a variety of sail configurations, we had the ride of a lifetime! We "barrelled" along at 6-7 knots ("barrelled" being a term relative to our normal 4-5 knots), with the waters rushing past. It was glorious. In fact, we even had to "put the brakes on" by shortening sail dramatically all night so as not to arrive at Guayraca in Five Bays in the dark. Despite the attempt to slow down, both boats had to stand "hove to" for an hour until daylight. By that time the winds were extremely strong and the seas 10-12'. It was not a comfortable wait. But Guayraca was well worth the wait! There were only five boats in this huge, magnificent anchorage. The Five Bays have been likened to the Norwegian fijords, cut deeply into unspoiled mountainous terrain. Everything is lush with vegetation- trees, scrub and cactus everywhere atop craggy steep slopes. We could have stayed here for weeks quite happily! The swimming and snorkelling among lovely corals and sponges, with a wide variety of species is almost pristine, if one ignores a number of floating plastic bags and beer cans at the end of the bay. The area has recently been declared a national park, so human detritus should be kept to a minimum in future. The night was a little unsettling with williwaw winds roaring down the mountains and causing untold new sounds in the boat. Just when you thought it was safe to fall asleep again, along would come another blast. However, one can become accustomed to these noises, once identified and sleep quite soundly in time. However, we did not get the opportunity to become accustomed to the night winds for long. While I was swimming, the guardacostas arrived, announced that no one could anchor in the park and that we must be out of here in the morning! When asked whether we could obtain anchoring permits, they just said "no". This is unusual, as BREAK & RUN stayed here a week or more recently without a problem. No one seems to know exactly what the situation is. This is the Goose Wing or Wing on Wing sail configuration. It works well for downwind sailing. 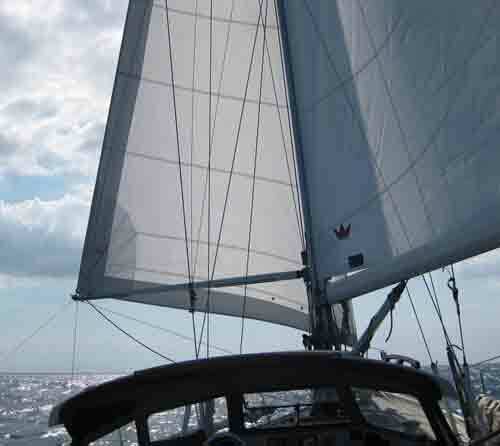 The jib is poled out and tied down securely with the spinnaker pole and preventer lines. The boom is pulled out in the opposite direction and held down with strong preventer lines. This captures as much of the wind behind the boat as possible. We are becoming quite adept at changing sides when the wind direction shifts!